Generoso and Lily’s Bovine Ska and Rocksteady: Rupie Edward’s Opportunity Label 3-8-16 – LILY & GENEROSO 4EVER! Here on the Bovine Ska, we adore Rupie Edwards. 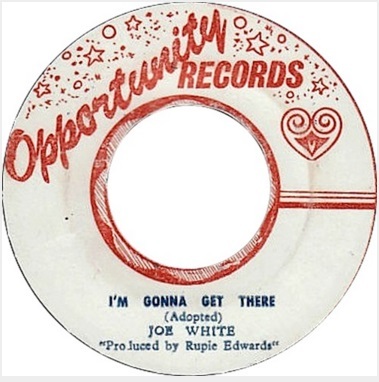 We underscored his well known Success label a few months ago, and on one of our search excursions, we saw the sweet label art of Opportunity, and we knew we had to spotlight this label, which has some excellent Rupie reggae on it. Born in Goshen, St Ann’s Parish but raised in St. Catherine, Rupie Edwards had a very early start in music. As a child, Rupie learned about music in school by his teacher’s lessons where she would tap a melody and the class would have to recognize it. By the age of 7, Rupie had a band with his classmates. As his bandmates played tin cans, drums, and comb kazoos, Rupie played the bamboo pipe, and at the age of 13, he moved to Kingston with his mother, arriving to a growing, thriving music scene. After attending Kingston Senior School for two years, Rupie focused on his music career at the young age of 15, first recording for Simeon Smith and his Hi-Lite label. The tracks did not take off his recording career, so Rupie pragmatically became a mechanic who repaired cars, and one of his jobs included Coxsone Dodd’s own Buick. During his time as a mechanic, Rupie did not give up music. He recorded with the Virtues, receiving his first production credit in 1966 for their track, “Burning Love,” but by 1968, the group split up. That same year, Rupie was able to open up his Success record store, where he hired Bob Andy to run the store, since Rupie still needed to be a mechanic for a bit in order to finance the shop. But ultimately, the music industry always beckoned him, and Rupie took the record shop as his full time job, focusing on his work as a producer and record label owner, releasing his productions on both Success and our label of tonight, Opportunity. Gregory Isaacs introduced Errol Dunkley to Rupie Edwards, and we are thankful for that because Dunkley’s tracks for Rupie are just too good. In his excellent biography, Some People Rupie hypothesizes that his own fascination with versions may have come from the fact that when he was a child, he learned God Save Our Gracious King and sang it in school. Then, when King George passed and Queen Elizabeth took over, the children all had to sing God Save Our Gracious Queen, giving Rupie a primer on how to change parts of songs while keeping the same melody, a technique he would most certainly utilize for his excellent versions on Opportunity.